The day I came back from summer school, I decided to check the iTunes Top 10 chart, just to see what new songs were popular. As I pulled up the familiar gray window, I noticed that a new song by a previously unheard-of artist had replaced Nicki Minaj’s “Anaconda” in the #1 slot. If you regularly keep track of charts like the Billboard Top 40 or iTunes Top 10, or even just listen to the radio, you have probably already guessed the song in question. 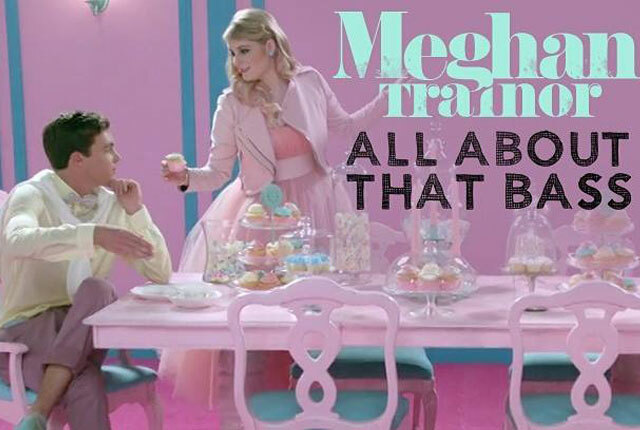 It was “All About That Bass,” by Meghan Trainor. I clicked play. As I listened to the song, I found myself humming along to the catchy chorus. It had a nice beat and a 50’s/60’s doo-wop feel. Plus, I liked the sound of her voice. Here, Trainor falls into one of the pitfalls of encouraging curvy-girl body positivity: the shaming of thin women. Another one of Trainor’s lyrics, “My mama she told me don’t worry about your size / She says boys like a little more booty to hold at night,” is particularly troubling. I understand what Trainor’s message is supposed to convey — that girls should not be afraid of boys rejecting them because of their size—but she implies here that girls should tailor their bodies to what boys find attractive. No, you should not worry about your size, but not because of boys’ preferences. Sorry, Meghan, but I don’t need to impress a boy in order to love the way I look. Trainor’s body acceptance moral reminded me of another singer with a similar message: Mary Lambert, who is no stranger to music with controversial subject matter—her most well-known contribution to music is “Same Love,” a collaboration with hip hop duo Macklemore and Ryan Lewis, centering on the issue of gay and lesbian rights. This is, I think, what’s missing from Trainor’s “Bass.” Lambert’s insistence that “you are no less valuable as a 32A” is reassuring to both thin and curvy women. Body positivity isn’t about tearing down skinny girls in favor of bigger girls—it’s about celebrating all body types and loving all shapes and sizes, and most certainly, not for the approval of men. With artists like Trainor and Lambert, it’s clear that society has come a long way from putting the thin body type on a pedestal and shaming bigger girls. But we need to stop ourselves from putting down thin girls, too. We need to keep in mind that the “pedestal” is big enough for all of us—thin girls and curvy girls alike. Previous Victim Blaming: The Media, the Photos, and the Death of Michael Brown by Abby D.
Next Stress and the Endless To-Do List by Nadya O.
great article… glad you addressed her “no offense, just kidding” lyric. Thank you, Kayla–I appreciate the feedback!